500 ++ days since the debut of You're Beautiful, the drama's Original Soundtrack still takes up top spots on the Gaon Music Chart. Similar to Billboard Charts, Gaon is a weekly and monthly music chart that tracks down the best-selling physical albums in Korea, created by Korea Music Content Industry Association. 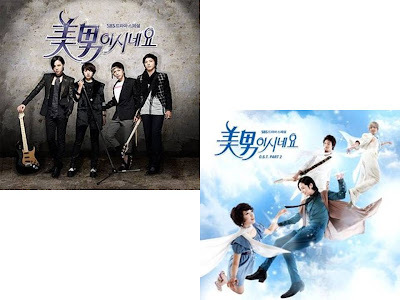 For the February 20-26 week, You're Beautiful (미 남이시네요) OST 1 and 2 have taken top spots on both the All Music (종합) and Domestic (국내) categories. For All Music, ranking the best selling albums in Korea, YB OST part 1 (which includes Park Shin Hye's "Lovely Day") takes 3rd spot as a new entry, while YB OST part 2 takes 7th place, three spots up from 10th place of the previous week. Meanwhile, for the Domestic Category, ranking music released in Korea for the Korean market only, YB OST 1 and 2 take 2nd (new entry) and 4th (from #12) spots, respectively. Congratulations to Park Shin Hye and the rest of the ANJell actors, staff and crew, for another milestone of this contemporary legend of a drama. wow maizey!!! that's fast and very good news indeed!!! all four had a hand in making it a hit! now if only they'd be given a chance to "launch" or even to say thank you to the fans who supported them huh? one last concert for the ANJells??? ANJells! ANJells! ANJells!ANJells! ANJells! ANJells! ANJells! ANJells! ANJells! ANJells! ANJells! ANJells! ANJells! ANJells! ANJells! wowww!! !if only anjell could reunite and release a new album,that would be sooooo great!!! You're Beautiful still going strong! Woohoo! chu ka durim ni da to our angels! i hope this drama will have a part 2! i lyk their songs lyk their acting so much "geunshin"